Parum Pugna: Plataea - Action! This was the first of what have become regular Christmas occasions – big battles fought on a big table, with the regular “generals” often supplemented by visiting commanders. 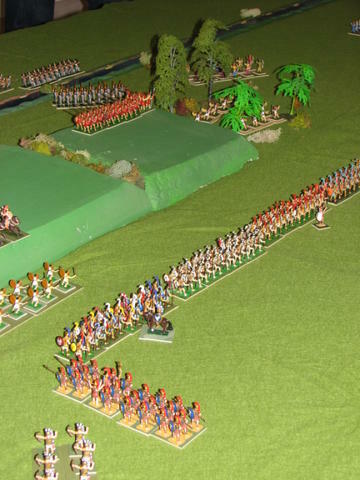 In many ways this was the type of game that Parum Pugna was designed for – close to a thousand figures in action and a battle fought from start to finish in around four hours. 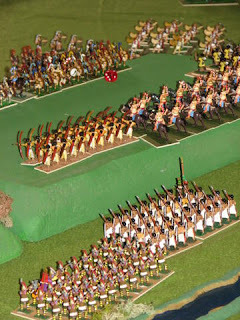 Discussing the Grant/Dover Coven’s Plataea re-fight on his blog, Ross poses the question of why the Persians didn’t exploit the open spaces and gaps in the Greek lines to surround their enemies. It is a real good question, though not one that could be asked of our version, since the Persian commanders opted for just that tactic – despatching all their cavalry to gallop off beyond the Asopus Ridge. Some were tasked with delaying the supporting Spartans and Athenian troops as best they could, while the horse archers were ordered to peck away at the phalanxes on the ridge. 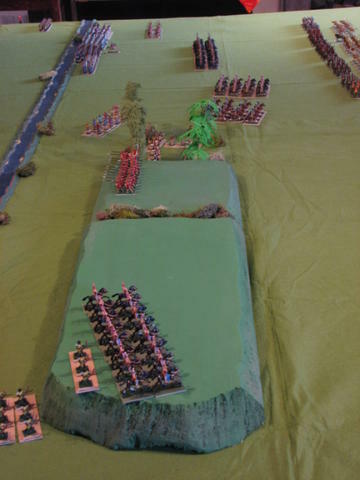 The bulk of the Persian infantry meanwhile was detailed to make a frontal assault up the slopes of the Asopus in the hope that sheer weight of numbers combined with the chipping effect of the light cavalry would eventually wear down the powerful Spartans. The Greeks had little option but to follow the historic order of events, hoping that the Spartans could hang on until help arrived. Heavily armoured and well-disciplined they proved less vulnerable to cavalry than the Persians had hoped, aided greatly by their light troops who performed wonders in protecting their flanks. One rule that had an effect on the outcome was using "command points" for the Persians. At the start of their turn the Persians threw 1 AvD for every five units in their command, the resulting score being the number of units that could move that turn. We had used a similar system for Marathon as a means of reflecting the greater cohesion and better command and control of the Greeks. At Plataea the Greeks were clearly not as co-ordinated and decisive as they'd been in that earlier encounter. However, I still felt that their more compact and better trained army gave them an advantage over the polyglot Persians. Sadly no detailed account of the action survives, but I have the following scraps from Stephen Caddy – commander of the Greeks - and myself – who, along with Clive Norman, commanded the “never victorious” Persians. continuous violence broken only by a brief pause to munch on some ginger nuts. After much bloodshed and some spectacularly lucky dice throwing by a unit of Assyrian spearmen, the Spartans were driven from the Asopus, before the advancing relief could arrive. Alas for the Persians the vast number of units they had at their disposal and poor command and control (how many 2s can you throw on an AvD?) slowed down all movement and they were unable to reinforce this success, before the Athenians arrived and hammered the depleted units on the ridge. A second wave of Persian troops proved less effective than the first. The toll amongst the generals was fearsome. Mardonius died while attempting to rally some Mede Infantry, Pausanius was cut down by Persian lancers and Aristedes of the Athenians was killed just as the Greeks claimed victory by a stray arrow from some marauding Dahae horsemen.